The very first vegetarian recipe. 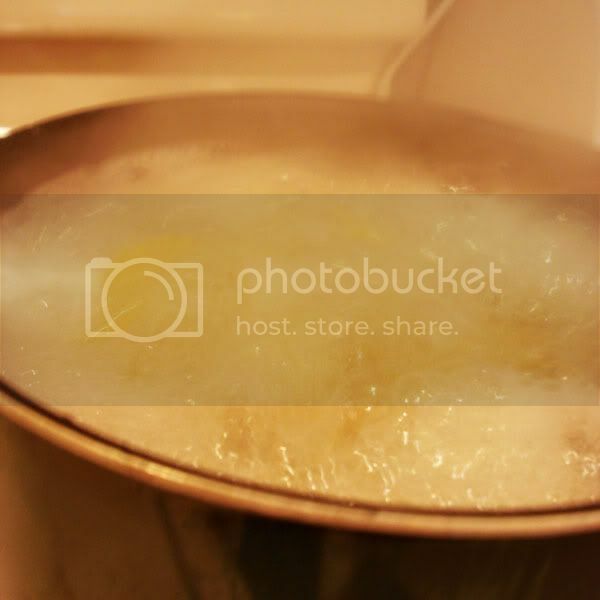 - Boil manicotti noodles in large pot of boiling, salted water for 5 minutes. 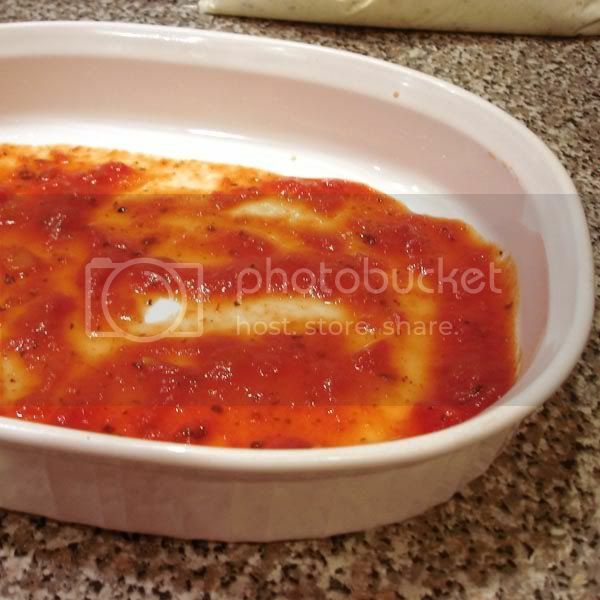 - Remove from pot and place on silpat lined (or oiled) baking sheet to cool. 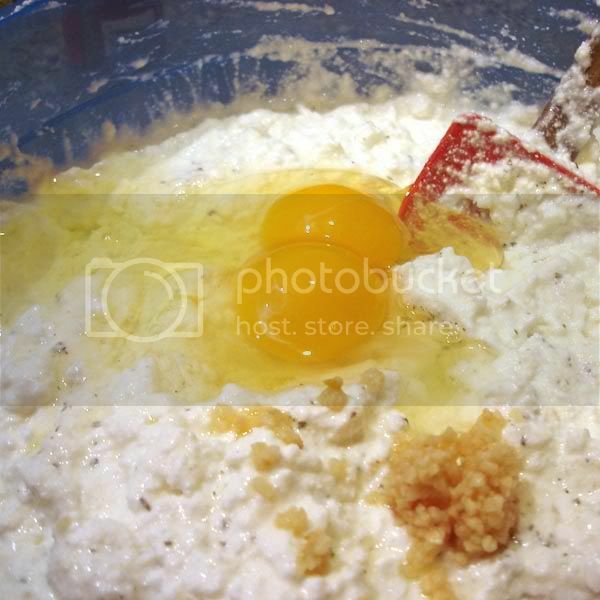 - Combine cottage cheese and ricotta cheese*. - add herbs, salt, garlic, eggs and frozen spinach (if desired). Stir thoroughly to combine. 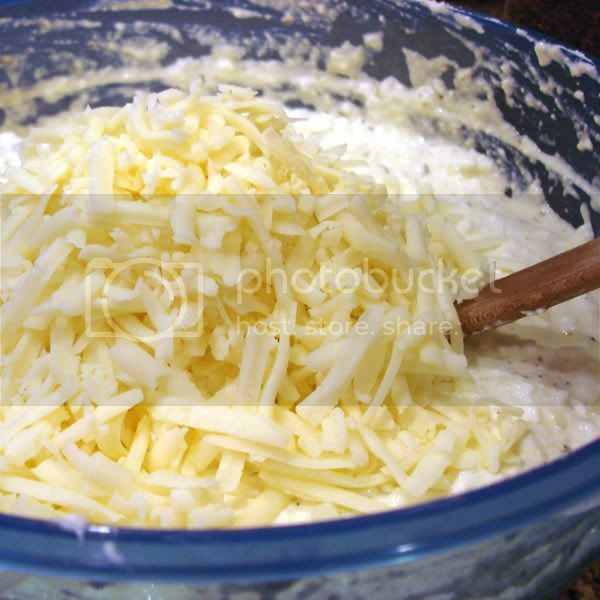 - Add 2 cups grated mozzarella cheese. Stir to combine. - Next you'll need a large ziplock bag and a pair of kitchen shears or clean scissors. Fill freezer bag with filling mixture. Seal top and cut small edge from bottom corner. This has now become like a large piping bag. - Spread 1/4 c sauce in bottom of pan (so noddles don't stick while baking). 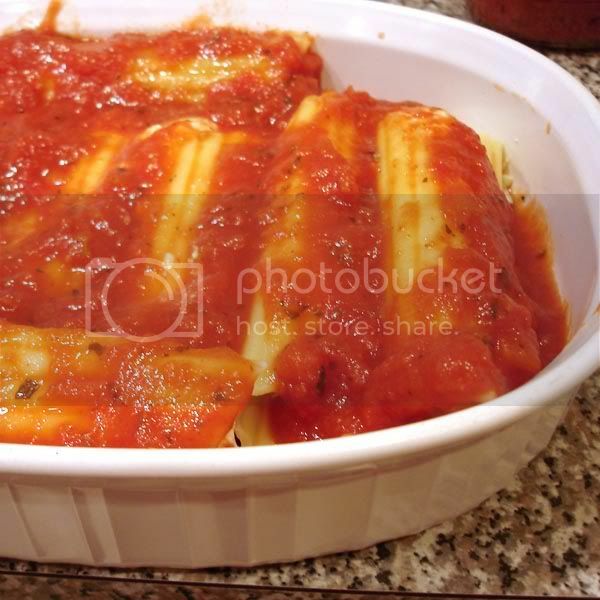 - Take manicotti tubes one at a time, hold noodle in one hand, place clipped edge of ziplock into the top of the noodle. Apply slight pressure to the ziplock to fill noodle with filling mixture. - Lay in close together, but not crowded, in a row in baking sheet. 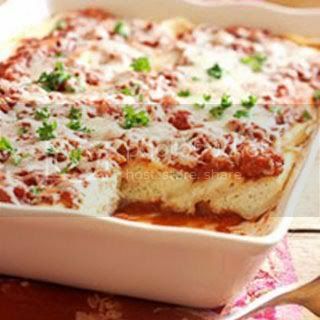 Repeat until pan is filled with one layer of filled manicotti. - Spread a layer of jarred sauce on noodles. 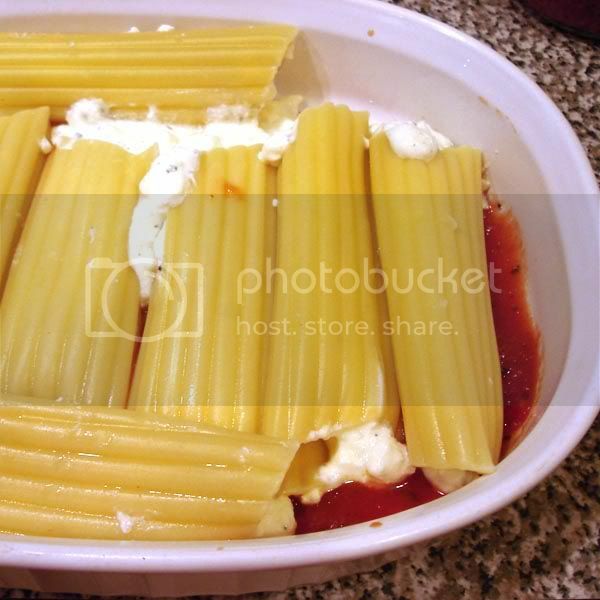 - Top with 2 cups grated mozzarella. 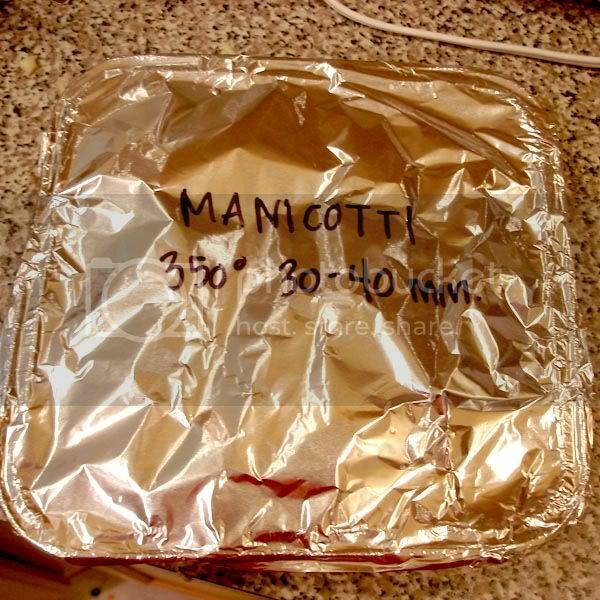 - Take piece of foil large enough to cover pan. 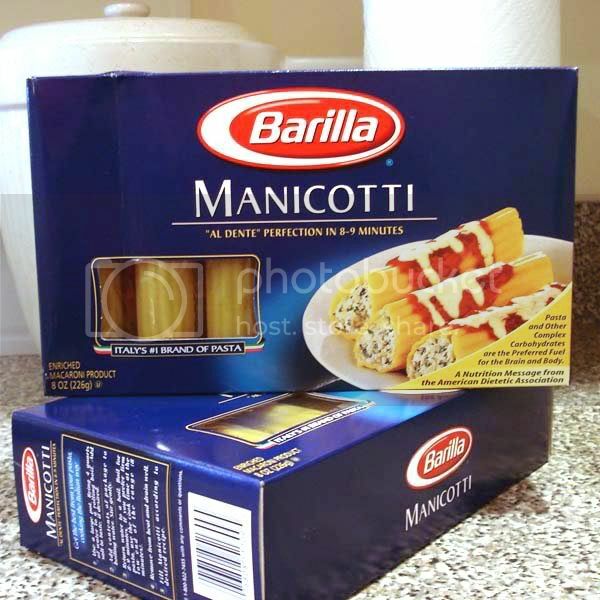 Write Manicotti and the baking instructions. Label with a red sticker to indicate that this item should be thawed before baking for best results. Repeat until all other pans are completed. 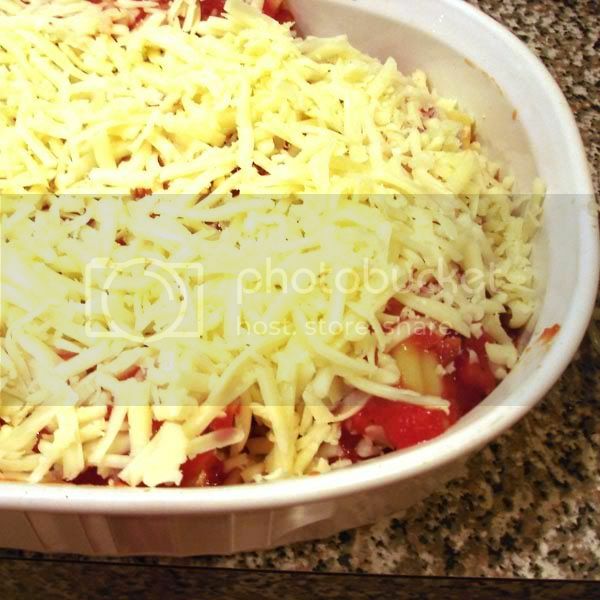 - Bake at 350 degrees for 30-40 minutes or until cheese is browned and sauce is bubbling. Sprinkle top with fresh cut parsley is desired. 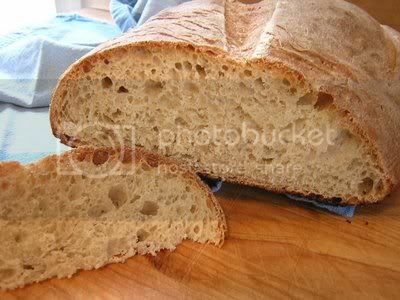 - Serve with rustic bread and a side salad. *Alright...let's talk soft cheese for a minute. I have always disliked the texture of straight ricotta cheese. I find it kind of pastey. Also, it's kind of pricey. Some people I know (including my mom) substitute with cottage cheese, but we all know that leaves your filling with no flavor or cheesy goodness. My solution is to mix the two 50/50. This is not only more affordable, but it makes a creamier filling. DE-LISH! I recently made a batch, after enjoying my own, for some friends who took care of our house while we were on vacation. They loved it too! this was the first recipe I tried from your site several months ago and it was a HUGE hit. We gave two of them away and the people raved about it!